Wisconsin officials are trying to understand why a hunter opened fire on others hunters Sunday, killing six people and seriously wounding two. Many of the victims were related - all from around Rice Lake, Wisconsin. The suspected shooter is a St. Paul resident who's had minor brushes with the law, but nothing apparently that would predict such a violent encounter. Birchwood, Wis. — The shooting took place in a small township near the borders of four rural, wooded counties. During deer season the woods are crawling with people in blaze orange, and it's not unusual to hear of small disputes, over property lines or who owns what deer stand. But nothing has ever happened of this magnitude. According to Sawyer County Sheriff Jim Meier, Chai Vang, 36, is accused of opening fire on a hunting party, killing six people and seriously wounding two others. The dead include Robert Crotteau, 42; his son Joey, 20; Al Laski, 43; Mark Roidt, 28; and Jessica Willers, 27. Dennis Drew died of his wounds Monday night. Still hospitalized are Terry Willers, who was listed in critical condition, and Lauren Hesebeck, listed in fair condition. Sheriff Meier say that the suspect was lost in the woods, and apparently wandered onto private property. There, he found and climbed into a deer stand. One of the property owners came by, spotted Vang in the stand and radioed back to his hunting party in a shack about a quarter of a mile away, asking who should be there. "The answer was nobody should be in the deer stand," Sheriff Meier said. The first victim, Terry Willers, told the others on the radio, that he was going to confront the intruding hunter. He approached the intruder and asked him to leave, as Crotteau and the others in the cabin hopped on their all-terrain vehicles and headed to the scene. "The suspect got down from the deer stand, walked 40 yards, fiddled with his rifle. He took the scope off his rifle, he turned and he opened fire on the group," Meier said. There were two bursts of gunfire within about 15 minutes. Apparently three of the hunting party were shot initially. One was able to radio back to the others that they had been shot. The others soon were on their way, apparently unarmed, expecting to help their fellows. But the shooter opened fire on them too. Meier says the weapon used was Chinese style SKS semi-automatic rifle. Its clip holds 20 rounds. When recovered, the clip and the chamber were empty. It's not clear whether any of the deer hunting party returned fire. 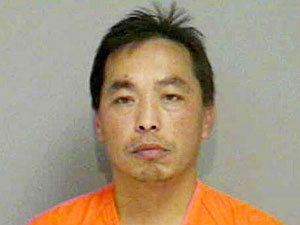 Chai Vang was taken into custody several hours later. He'd been identified by the ID number which Wisconsin deer hunters are required to wear on their backs. Vang is reportedly a veteran of the U.S. military. He emigrated here from Laos. Sheriff Meier says Vang does appears to be mentally stable. "From my dealings with him, he seems mentally capable of conducting his affairs. His criminal history is, I believe, there's a misdemeanor warrant for trespass out of a county in Minnesota, and he does have an entry in his file for an aggravated assault," he said. Meier says the alleged shooter has remained extremely calm and has not confessed to shooting anybody. He says the suspect's calm is frightening. "I just don't think any of this makes sense. And the demeanor makes no sense, and the action makes no sense. I can't even speculate on ... what was in his mind or what he was thinking." Residents of this wooded area are shocked and baffled. "Nothing ever happens in Birchwood. Which is why it's so weird that in such a small town that something like this could happen over just a feud over land. It's just ridiculous," said Stephanie Guerra, who lives on property near the site of the shooting in Birchwood Township. Wisconsin Gov. Jim Doyle traveled to Hayward to offer his support and extend to the families the state's sympathies. Doyle said the incident casts a real sadness over the hunting season and Thanksgiving. "This wasn't really about hunting," the governor said. "Who would think that a little whatever happened out there ... a little dispute about who should be in a tree stand. This is the sort of thing that happens all the time, and the response was beyond what anybody could ever have imagined." While authorities do not know why Vang allegedly opened fire, there have been previous clashes between Southeast Asian and white hunters in the region. Locals have complained that the Hmong, refugees from Laos, do not understand the concept of private property and hunt wherever they see fit. In Minnesota, a fistfight once broke out after Hmong hunters crossed onto private land, said Ilean Her, director of the St. Paul-based Council on Asian Pacific Minnesotans. The scene Meier described was one of carnage, the bodies strewn around 100 feet apart. Rescuers from the cabin piled the living onto their vehicles and headed out of the thick woods. The shooter took off into the woods and eventually came upon two other hunters who had not heard about the shootings. Vang told them he was lost, and they offered him a ride to a warden's truck, Meier said. He was then arrested; authorities plan to bring charges against him later this week. When you're hunting you don't expect somebody to try to shoot you and murder you. Mike Bartz, the Wisconsin Department of Natural Resource's regional warden supervisor for the area, said the SKS is legal for hunting in the state and has no restrictions. He said it is not uncommon to see hunters with the guns. "We see more and more of them being used. They're a fairly cheap weapon. They fire a cartridge very similar to a .30-30, which is a very common weapon used for deer hunting," Bartz said. The arrest has left some Hmong citizens in his hometown fearful of a backlash. Michael Yang, a Hmong activist, said various Hmong groups held an emergency meeting Monday to talk about how to respond. Those at the meeting heard stories from some Hmong hunters about friction with white hunters. The shooting has already provoked racial tension in an area of Wisconsin where deer hunting is steeped in tradition. "It's pathetic. They let all these foreigners in here, and they walk all over everybody's property," said Jim Arneberg, owner of the Haugen Inn in nearby Haugen.